The Southern Maryland Association of REALTORS® holds a ceremony every year for the installation of new officers and directors to the association in October. Congratulations to our newly installed Board of Directors! 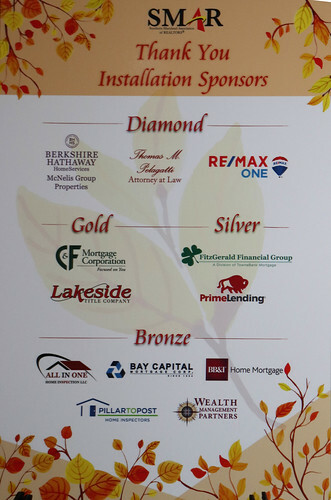 Almost 200 were present at Running Hare Vineyard on October 24th to recognize the volunteer spirit of our members! The program included networking, a delicious dinner, followed by recognition of special guests, outgoing and current Board of Director members, Committee Chairs and Past Presidents. Outgoing President Kathy Lee Suite gave "A Reflection of the Year" where she recapped accomplishments of the past year by the Bylaws Task Force and SMAR Committees.